Manor Farm, a farm that lives under harsh control of Mr. Jones, struggles from hunger and fatigue. Old Major, an elderly and respected pig, speaks to the farm and claims that animals are spending a tremendous amount of effort and getting nothing in return. Thus, Animal Farm must hold a Rebellion toward the human beings for their own liberty. A few days later, Old Major passes away and two new leaders are chosen, Snowball and Napoleon, whom are both pigs. One day, Mr. Jones and his men decide not to give the animals food. To their surprise, the animals lash back, causing the Rebellion, as Mr. Jones as his men panic and flees. Snowball and Napoleon renames the farm “Animal Farm” and creates seven commandments to prevent the animals to become “human-like.” As winter approaches, the two leaders begin to contend with one another. Although intellectual Snowball is effective, Napoleon becomes envious of his work. Thus, Napoleon ruins Snowball’s plans and orders his dogs to chase him out of the farm. Since Animal Farm is now under Napoleon’s rule, he demands more work to be done and decreases food rations. Napoleon’s cruel leadership and blood-thirsty tyranny forces animals to labor through fear and slaughtering. The seven commandments were later changed to the advantage of the pigs, allowing pigs to be able to sleep on beds and even wear clothing. 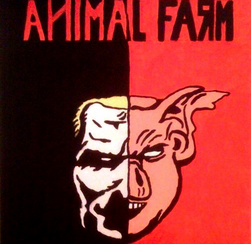 Animal farm could become utopia of living in peace and happiness, or it could eventually become ruins. George Orwell depicts a deep meaning behind the story. He contrasted the communism of the Russian Revolution to his novella, Animal Farm. The authors used a strong sense of imagery and literary techniques. Orwell uses allusion very oftenly as he compares characters such as Napoleon the tyrant to Stalin Trotsky of the Russian Revolution. He explains thoroughly the hardships of the animals living under torment and the sorrow they experience. Although the book is very interesting, I do not recommend it to students in middle school or younger, for that they may not understand the concepts behind the story. The story is not very exciting or adventurous and does not give a pleasant ending. After reading the story, Orwell’s description of the pigs made me begin to dislike pigs for that they were the cause of the disbalance of Animal Farm. Orwell has also provided a variation of vocabulary which made the story more interesting. I would rate this book seven out of ten stars. 1. What is Beasts of England and what does it represent? 2. Why were Snowball and Napoleon selected the new leaders of Animal Farm? 3. Why would some rules of the seven commandments related to the relationships of animals and human beings? 3a. That way, the animals won’t adapt and act like humans and they want no contact or similarities to humans because they are cruel. 4. What is Boxer’s motto? 5. Why would Snowball want to build the windmill? 6. Why would Napoleon decide to build the windmill after all? 7. What was Napoleon’s purpose for beginning trade? 8. How and why would Squealer convince the other animals about pigs sleeping in beds? How do they react? 9. Why would Napoleon blame Snowball for the windmill’s wreckage? 10. Why would so many animals confess their “crimes”? 11. Why would Frederick scam Napoleon? 12. What do you think caused the downfall of Animal Farm? 13. Did the farm improve at the end? 13a. It definitely did not improve. In fact, the farm has eventually came back to the way it was. 14. Why did Mr. Pilkington congratulate Napoleon? 15. What does this story tie to? 15a. This novella related to the Russian Revolution for that it shows the different types of leaders. Napoleon and Snowball were described as Stalin and Trotsky.